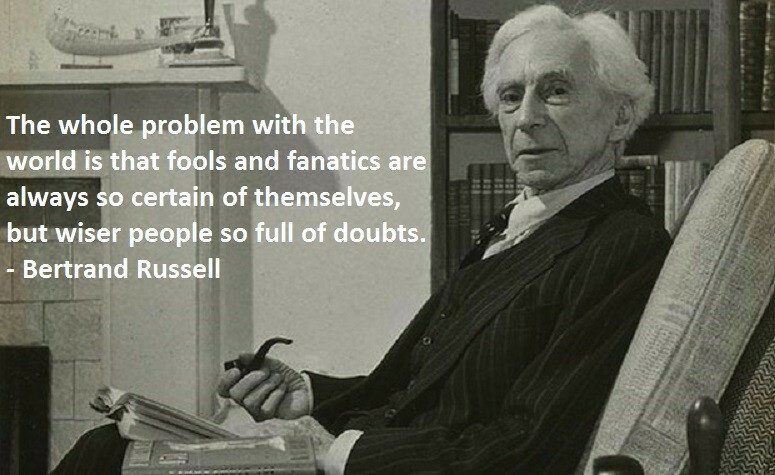 Bertrand Russell was a British philosopher, logician, mathematician, historian, writer, social critic, and political activist. He was a prominent anti-war activist. He championed anti-imperialism and went to prison for his pacifism during World War 1. Later, he campaigned against Adolf Hitler, then criticised Stalinist Totalitarianism, attacked the involvement of the United States in the Vietnam War and was an outspoken proponent of nuclear disarmament. - Wikipedia. I enjoyed his books, and speeches. I always enjoyed reading philosophy. From my early reading career, which has stagnated, somewhat, in recent years, as I realise, the books I really enjoyed, were written by, very entertaining, very bright, but mischievous, persons, like, Bertrand Russell Brand. I see you now. No doubt. - Sparky.